The Vermont Country Store has a one hundred year-long history of quality services and goods. With nearly a thousand staff, famous stores, and catalogs - merchants at The Vermont Country Store fill the needs of American and international customers alike. 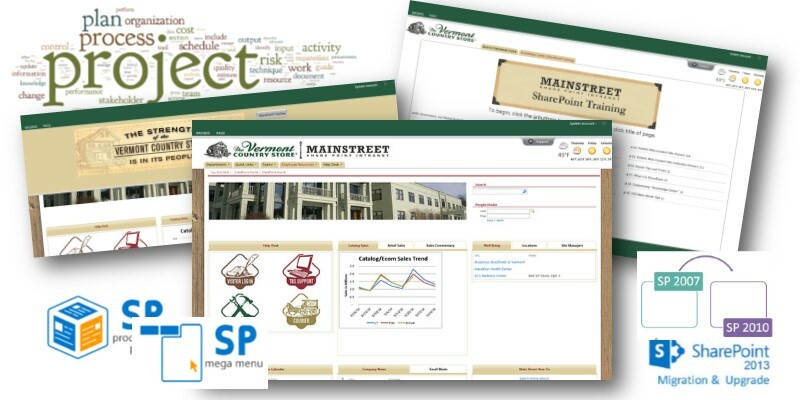 The Vermont Country Store's SharePoint 2007 was an essential system and a gateway to many of their line of business applications. SharePoint was used for a diverse range of areas from images content management to workflows concerning key processes, document repositories for HR, and many other areas. VCS engaged SimpleSharePoint when they realized they needed assistance with migration from 2007 to 2013, and most importantly expert technical guidance. The SharePoint 2007 farm was mission-critical and yet an older technology that was aging. Exhibiting instability, databases had grown quite large, and there were many customized third-party web parts installed. This presentation was typical of a dated platform, as was the further complication of being unable to jump directly from 2007 to 2013 without stopping at 2010 first. Their IT director John Spencer had the vision to engage our firm for a strategic roadmap to interview stockholders and to build a plan that would not only get them migrated to 2013, but also ensure the technology was a valuable asset to their portfolio of software tools. After completing a strategic roadmap by interviewing a range of stakeholders we collated our findings for a roadmap plan and strategy to get best ROI from SharePoint. One of our first strategic decisions that had been decided was to abandon the failed 2013 farm, as it did not meet best practices architecture, and to start fresh with a solidly built 2013 farm. With cooperation, several virtual machines were stood up and we installed 2013. To overcome the obstacles of limited resources and the challenge of going from SharePoint 2007 to SharePoint 2013 we provided a loaner server as a working platform. With that loaner server, we were able to copy their 2007 farm into this platform, raise it up to SharePoint 2010, and migrate it to their new production 2013 farm. This process was repeated three times to uncover all undocumented code and database issues that existed in 2007. We then set up a scripted synchronization that would take their 2007 and keep it in sync with their 2013 farm data. A tremendous amount of corporation and coordination was required from all team members, and thanks to the excellent project management capabilities of Russ Glitman, it went very smoothly. We did encounter a few technical roadblocks but were able to cooperate, organize, devise action plans, and work the process to get the job done. At the same time that our engineering team was working on synchronizing data between farms, our creative team was engaged with VCS's branding team. We were able to create a design to closely mimic their compositions. To ensure the success of this project we deployed several of our Porteo modules, and our enhanced SharePoint navigation Mega Menus and simple tabs, welcome banner, and Infopedia (our multimedia training system) for user adoption and support. To summarize the way the project went - the users went home at the end of the workday and when they came in the next morning they had gone from 2007 to 2013. The new branding had an improved navigation system and built-in user support system with multimedia training. As said by project manager Russ Glickman, "it was a success because there was no interruption or no surprises." Our trainers then went on-site and did a course for power users and we remain in a managed SharePoint agreement status and are planning areas for business process automation. As one of the oldest SharePoint consulting services, we can do it all. We have ready made apps to make navigation easier, we're excellent at making good branding for sites, and we can do SharePoint migrations with no interruption to users and with no surprises. We invite you to learn more about our SharePoint Mega Menus and SimpleTabs as well as our zero business outage SharePoint migrations and SharePoint branding services and contact us today!